Some pundits have suggested that the blog is dead, but it’s not. Blogging has simply evolved from a consumer activity into a sophisticated marketing tactic. The best marketers have figured out that if you’re going to have long-term success in this content marketing evolution, investment in owned digital properties is mandatory. 71% of marketers are increasing their spend on content marketing this year. More specifically, 80% of marketers use blogging as a part of their content marketing mix, as reported by CMI and MarketingProfs in a recent benchmark study. This group not only has high traffic, but they also get high referral rates from their blog to their corporate web site, and they see higher impact of their blog activities on key marketing metrics including quantity and quality of sales opportunities. Perhaps the most interesting statistic we found is that although 44% of 10K Club members have blogged for 5+ years, 56% of all bloggers who have blogged for 5+ years did not make it into this club. This suggests that an established online presence does not automatically lead to success. Instead, we must look deeper into the specific tactics of the 10K Club, starting with strategy. When looking at overall content marketing strategy, the best bloggers understand that their blog is just one piece of the owned media puzzle. The members of the 10K Club are focusing on building up their website, microsites and social communities as well. 10K Club members plan to invest in their blog(s): 56% of these bloggers have plans to hire additional resources dedicated to their blog(s) in the next 6-12 months. In addition to hiring resources for blogging, these marketers understand the importance of a governance team or center of excellence (CoE) within their organization. Although content quality is more important than quantity, publishing blog posts on a consistent basis is still essential. 90.5% of the 10K Club publish blog posts weekly or more often. However, publishing a lot of short posts just to increase frequency will not lead to success. The length of blog posts is also important. 10K Club members said that more than 50% of their posts have 500+ words. Publishing – The majority of bloggers we surveyed use the same tool for publishing content (a resounding 66% of respondents use WordPress over tools like Drupal or HubSpot.) 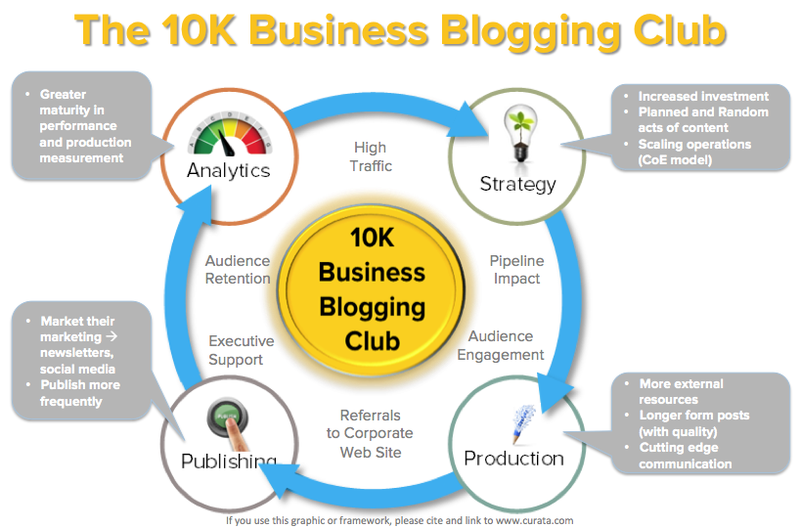 What sets apart the 10K Club bloggers is their ability to promote content in new and innovative ways. All bloggers depend upon many teams and channels to promote their content: But, the 10K Club stands out from the rest of the blogging pack in several ways. Align with their social media team. Involve blog writers in the promotion process. Leverage the power of paid media. Send newsletters and send them often. Analytics – 10K Club members are highly methodical and “cutting edge” users of technology to measure the impact of their blog. The greatest difference between the 10K Club and the rest of the pack is the sophistication of measurement. The 10K Club members push beyond “soft metrics” like page views and social shares and spend more time measuring and fostering long-term relationships. More specifically, they measure engagement and the effect on marketing and sales pipeline.